Modern digital printing technology has made it possible to produce small print-run, full colour and high-resolution books and magazines at remarkably low prices. One result is to make possible a huge improvement in the quality of specialist handbooks and catalogues on which philatelists rely. The stamp issues of Batum and their associated postal history are not a neglected field – there are the handbooks by P T Ashford and R J Ceresa for example - but Hans Grigoleit and Edward Klempka have seen the possibility of modern technology and this full colour book is the result. It allows the collector or dealer to see very clearly how things typically look and how they should look to be genuine. The written text then amplifies the information available visually. It all makes life a lot easier. Despite the earlier handbooks, there is much that is new here drawn from the authors’ own substantial collections and those of other collectors (Taylor, Alshibaya). It is also important that the authors have set their study in a Before and After context, looking at the end of the Imperial period and the beginning of the Soviet period. I just want to add a few remarks about the last British Occupation issue, the one which is most common (Michel 45 – 53). 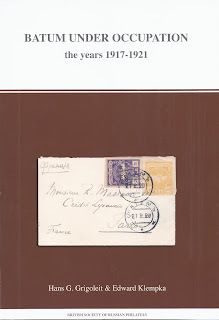 This had a very large print run ( over 1.8 million stamps) and the genuine stamps are very common. However, the Batum postmaster Major Goate claimed in 1941 that on withdrawal from Batum, “the whole of the residue of Batoum postage stamps was taken on a destroyer and sunk in the Black Sea” – his statement is reproduced from the original at page 149. I very much doubt that this statement is true. But it is a curious fact about the last issue that many of the remainders, which can be found in sheets and large multiples, are water damaged with gum washed off or sheets stuck together. It’s possible that this damage occurred on the Black Sea but I have also heard it said that the damage results from a bombing raid on London in the second world war which flooded the stamp wholesalers who held the stock. It is, of course, possible that Captain Goate’s destroyer carried both unsold remainders AND large quantities of stamps which had been bought up (maybe at a discount on face value) and were destined for delivery or re-sale in London.